“Log on” and “Register” is the original terminology that goes way back to the good old mainframe days. With the advent of personal computers and evolution of Internet, and with all the social media hype, the terms have become more popular than ever. The common terms being used today are “log in” and “sign up” which are interchangeable with “sign in” and “signup”. You can see both sign up and signup are synonymous and different websites use them differently. 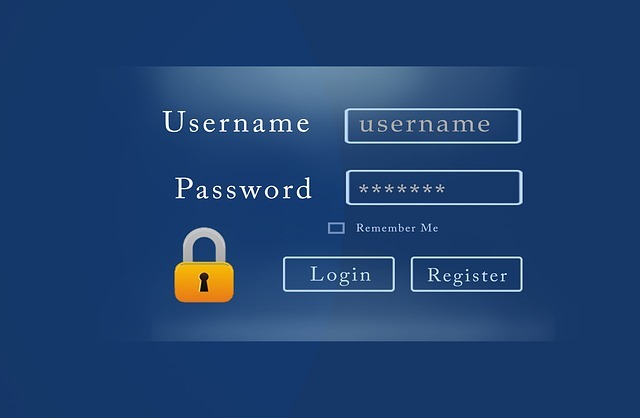 Similarly, sign in and log in are synonymous with each other and are used basically for the same purpose – that is to authenticate yourself to an account that is already created by you. Sign up simply refers to the process of registering yourself to create an account. They both are all over the internet and the difference is quite subtle. Login simply means to validate the user like authenticating the user. It means the user is identified and authenticated to access the website or a program where he/she is already registered. Login works both in web portals and web applications. In simple terms, it means to open a session with an already created account. For example, you can login to your Gmail using your credentials meaning you have already created an account with Gmail and your email ID and password is saved with them. By logging in what you simply did is authenticating yourself to gain access to your Gmail account. It is just an action which identifies you as a returning user rather than sees you as a new user, in which case you have to sign up. Though sign in and login are often used interchangeably, login has more of a technical connotation. Login is to verify yourself to gain access to a website that has different interface as guest. However, some websites cannot be accessed via a guest account. For example, Facebook does not allow you to login if you are a guest. On the other hand, sign in authenticates the user even as a guest, meaning you can access the website even with the guest account without actually signing in. For example, Google allows you to access the search engine without the need to sign in. Both mean almost the same that you can access account where you are already registered. 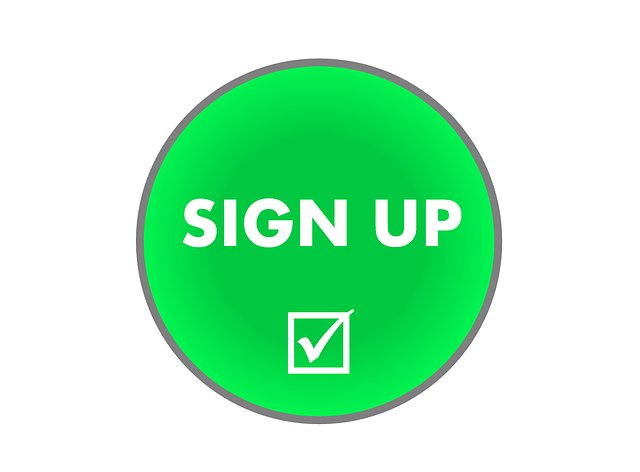 Sign up is an action to register yourself for a new account. Different web portals might use different terms for returning users but they all use “sign up” for the process of first time registration. It simply means to create a new account – be it a portal, application, or newsletter. When you wish to access some portal or application for the very first time, you need to sign up. For example, you need to sign up before you can access your Gmail account which requires you to fill your details like name, address, email ID, contact number, and a password to log in. If you are not a registered user already, you are always required to register. For example, if you want to access Facebook and to know what it’s all about, you have to sign up first so that you can log in with your credentials from next time onwards as a returning user. Simply speaking, when you sign up for something, you actually register yourself as a new user. It is an action that better describes how you can interact with the websites. Sign up simply means to create an account. You can see the “sign up” button usually in the upper right corner of the portal and you can also see the “sign in/log in” button to the next. The phrasal verb is separable in login, meaning you can separate the “log” and “in” or use it simply as “login”. Same goes for “sign up” or “signup”. Both the terminologies are used in the same context but for different purposes. Login identifies you as a returning user whereas sign up describes you as a new user. Login means you are already registered and your name is on the list. Your credentials are already saved with the account and you are just authenticating yourself as a returning user. Sign up, on the contrary, is an action taken by the user who identifies himself as a new user. When you access or visit something for the very first time, you need to sign up before you can successful log in. As a user, you cannot be logged in to a website or account as a guest. The guest interface is disabled for the guest user. For example, you can only access Facebook and its members by logging in, but not as a guest user. However, you can use Google even as a guest user. Sign up simple means entering your information into the system to register yourself as a valid user. You only need to enter your essential information like user name, email ID or password to authenticate yourself as a registered user. For example, you only need your Twitter handle or email ID and password to access your Twitter account. On the other hand, you need to enter all your basic information such as first name, last name, email ID, phone, address, credit card details, etc. to sign up for an account. The main difference between the two lies in the term itself. You log in to officially record your presence as a returning user, whereas sign up simply registers your intent to be present officially in the system. Sign up means to create an account as a new user so that you can log in later with your credentials. In modern day computing, log in authenticates your presence in the system while presenting you with tons of options that you are entitles to view and process. As with sign up, it is simply called as “register”. Difference Between Bluehost and HostGator: Which one is the one for you? Bluehost vs GoDaddy: Who’s the better host? Sagar Khillar. 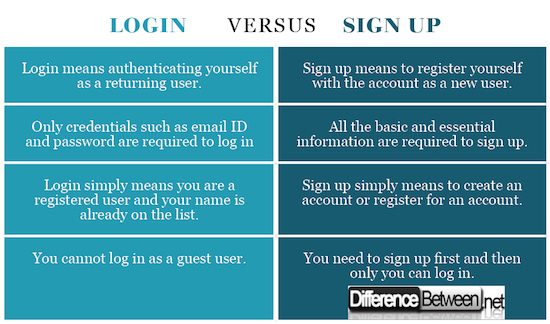 "Difference Between Login and Sign up." DifferenceBetween.net. May 31, 2018 < http://www.differencebetween.net/technology/difference-between-login-and-sign-up/ >.